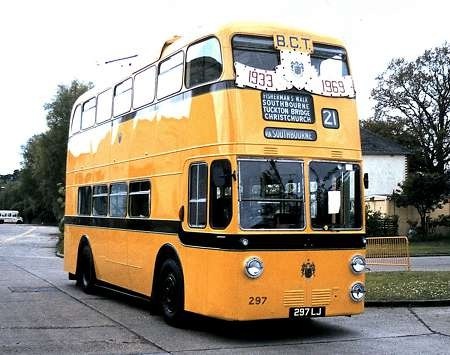 This Sunbeam MF2B was one of the last trolleybuses built for operation in the UK, in 1962. In a disgracefully short career, the batch was withdrawn when the system was abandoned in 1969. The livery can only be that of Bournemouth, and the body is by Weymann, to H65D configuration. She’s in the yard at Mallard Road for an open day on 22 May 1983. Note the special “End of Trolleybuses” decoration. The open day marked 50 years since the opening of the trolleybus system. Whenever I see pictures of these vehicles (and the equivalent Hull trolleybuses) with such clean lines, I always think what a pity the AEC Q was not resurrected after WW2, instead of attempting the Regent IV. We may have seen buses as handsome as this in the 1950’s. Beautiful photo of a very attractive vehicle in the lovely Bournemouth livery. You are so right, Allan, in comparing it with the AEC’s 3Q3 Q’s. Here is a picture of LPTB’s 1934 Q5 on the open road, showing just how advanced the body styling was, in this case by Weymann, for this innovative chassis. I grew up with these beauties passing the end of my road, in Bournemouth. They were certainly clean-lined and to my eyes they still look modern. The last batch of MF2Bs with the red seats & cream interiors had an especially light and airy feel to them. However, mechanically the design suffered with weak half-shafts which had not been a problem with Bournemouth’s earlier B.U.T. and Sunbeam designs. I rode on 297 LJ on that fateful day in May 1969 as a schoolboy. My parents swapped tickets with me so I could ride on the "pretty bus". The final parade started at Bournemouth pier where I had a seat on 301 LJ (which actually was my favourite) As I’m sure you all know, 301 was the last British trolleybus to be built. What a waste! The last "proper" trolleybus, Tim. South Yorkshire PTE tried out a Dennis Dominator trolleybus in 1985, but the scheme went no further. Now, what was the fleet No of the Bournemouth Mf2b I rode on in the Black Country Museum some 12 years ago? This photo of Reading Corporation 178 a Sunbeam S7 with Park Royal H38/30RD bodywork, delivered in November 1950, was taken 18 years later on the last day of trolleybus operation Sunday 4th of November 1968 as I recall a very cold but bright day. Taken when 178 was negotiating the turning circle at Tilehurst opposite what was then the Three Tuns pub to pick up for the return trip to Wokingham Road, unlike some of the later Sunbeam F4A’s which went to Teesside these had come to the end of their lives although 181 was, if not, still is, in preservation. It looks sad, as do all vehicles on their way out. Liked the "Baylis Supermarkets says Goodbye to Reading’s Trolleybuses" advert on the side, DD! Occasionally, I visited Reading and think they were at Caversham. I really don’t recall the trolleybuses having platform doors (never travelled on one)- was this common? Diesel Dave and Chris H: The first Reading trolleys with platform doors were the 4-wheel BUTs of 1949. William John Evans liked spacious raised platforms with doors, generous staircases and—for the trolleybuses—deep windscreens, and whatever the stern WJE liked, he got. The same arrangement was found on the 6-wheel Sunbeams, as shown here, on the 1950 Crossley DD 42/8s and the 1956/7 AEC Regent IIIs. Baylis certainly did have a Caversham branch, which outlived their main shop on the corner of Broad St and St Mary’s Butts, right in the town, which became the first self-service shop in Reading. It was an odd sensation picking what you needed off the shelves! The Three Tuns is actually at the Wokingham Road end of the route. Thanks for a nice nostalgic posting. Thx, Ian T, for the extra info. The first supermarket I ever used was, bizarrely, a MacFisheries in Fareham. which accepted credit cards. The next one was a Victor Value, in Portsmouth itself, a group eventually swallowed up by Tesco. It was strange to pick stuff off the shelves yourself. Is this the Trolleybus that Matchbox modelled their #56A on? 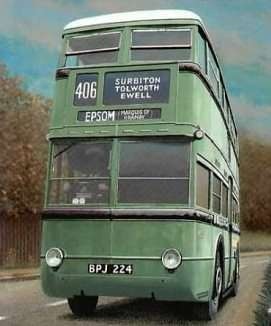 Geoff, the Matchbox 56 trolleybus was based on a London Transport Q1 class trolleybus, complete with a route no 667. For its size and era it was quite a good model, even though intended merely as a toy. (I had 18 of them in my "fleet"!). Reading trolleybus 181 IS still in preservation. It is privately owned but is based at the Trolleybus Museum at Sandtoft (near Doncaster). The museum has overhead wiring to enable some of the 50, or so trolleybuses, based there to run on regular open days. There is going to a big Reading event next year, so you should be able to see 181 run. I have been three times and it is a great day out, but I should think it will run before then. Perhaps a phone call to them will give you more information. Passing through Sedgley on its way back to its home town, Wolverhampton 451 was nearing the end of its days in early 1967. Built in 1948 with a Park Royal body and rebodied in 1960, these vehicles saw out the once extensive Wolverhampton trolleybus system. It is working on route 58 from Dudley to Wolverhampton, which in its time had seen horse steam and electric trams and also, incidentally, the only trolleybus route to enter Worcestershire. The end came on March 5th 1967. Thanks, Tony for posting this reminder of how many Roe trolleybus rebuilds there were. It has always puzzled me why Roe got so much of this trolleybus rebuild business. Did they actively seek it, or was it simply available capacity? In any event, they were a smart addition to the street scene, but many sadly never had a full life, being prematurely scrapped on system conversion. Apart from Wolverhampton, and purely from memory, Roe rebuilt trolleybuses of this style operated in Doncaster, Teesside, Maidstone and Ashton. Anywhere else? You partly answer your own question, Paul. Doncaster, Teesside, Wolverhampton and Ashton were established Roe customers. [Don’t know about Maidstone.] Roe were experienced at bodying trolleybuses. QED. Go where you had experience of the expertise. They also rebodied 6 wheelers for Huddersfield and Rotherham. Actually Paul, it wasn’t just trolleybuses. Roe also re-bodied hundreds of War-time utility Guys. I think the fact that Roe bodies were teak framed as opposed to metal framed had something to do with it. Trolleybuses had to pass some sort of earth leakage resistance test and with wood being an insulator rather than a conductor of electricity wooden framing aided the bodywork in complying with the earth leakage requirements. Can anybody confirm? David, the situation regarding Ashton and Roe is not as you describe. Ashton only bought two Roe bodies on new chassis prior to the first PD2s delivered in 1960, these being 65 and 66 on Sunbeam W chassis which were delivered in 1946 when their traditional suppliers, Crossley and English Electric, were unavailable for different reasons. When it was decided to rebody wartime trolleybuses in 1954/5 the work went to Bond who rebodied 2 Sunbeams, being 63 and 64. In 1956 eight new BUT trolleybuses were ordered and bodied by Bond and it had been intended that wartime Sunbeams 61 and 62 would be rebodied by the Wythenshawe concern but the company closed so the contract was put out again to tender which was won by Roe in 1957. The last motor bus deliveries to Ashton prior to this was for the Bond bodied Guy Arabs which were originally numbered 37-40 and delivered in 1956. 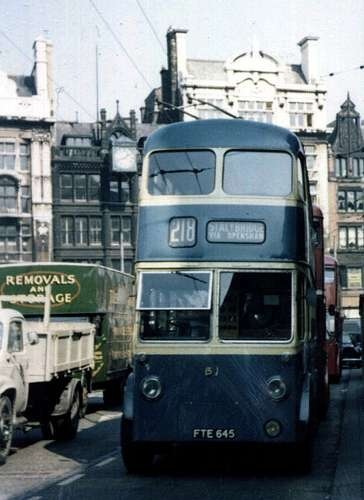 The 1957 Roe bodies for the Sunbeams must have impressed because the next vehicles ordered were thee 1960 PD2s and Ashton stayed with Roe until 1967 when East Lancs bodied Leopards were ordered followed by Northern Counties bodied Atlanteans in 1969. So if both Wolverhampton and Dudley were then in Staffordshire, where did the t/buses stray into Worcestershire, Tony? Although I think much of Ted Heath’s county re-organisation was wrong, there were some mismatches. It was bizarre that enormous Birmingham was in Warwickshire, with its small, peaceful, market town. Would love to know the answer to whether Roe actively canvassed the trolleybus rebodying business or just that were a very good bodybuilder. The Roe bodies always looked elegant and so up-to-date on trolleybuses and very modern for the time. Attached is one of my first colour photos of Ashton 61 in Piccadilly, Manchester in the last week of trolleybuses. Well Ian. Regardless of whether they did any canvassing they were a very good body-builder – one of the best. Chris H, Dudley was a County Borough in a detached portion of Worcestershire. Before the political meddlers leapt in, parts of the Lake District were in a detached portion of Lancashire – 3/4 of the Windermere shoreline was, but the water itself was entirely in Westmorland. The newish Roe rebodies on Doncaster’s second hand trolleys found themselves new motor-bus chassis and half cabs when the trolleys were withdrawn and some of these chassis in turn were quite old- but some were brand new. You could tell which they were- as remarked here before- because they had the old cable trunking in the upstairs window frames and some of the bodies were a bit proud & vertical at the front. I also think that the Corporation did a lot of the conversion work themselves? Bradford Corporation Passenger Transport obtained sanction in November 1950 for 12 new bodies for their 1938/39 AEC 661Ts and Karrier E4s, but an offer from C H Roe to supply 7′ 6" wide bodies at a lower cost than those previously supplied for 8′ 0" wide BUTs 740 – 751 was rejected by the City Council, who insisted on completive tender. 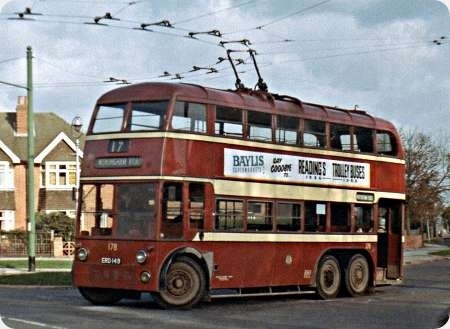 The successful company was Crossley Motors who supplied them in 1952 and a photo of one of these trolleybuses has previously been posted on this web site by me and can be seen here. Clearly this is evidence that C H Roe was actively seeking business, but had their offer been accepted, Bradford may well have followed a different trolleybus re-bodying route from 1956 onwards. Thanks, Richard, for this interesting information regarding Bradford and Roe’s failed attempt to obtain the trolleybus rebuild business. It has always puzzled me why Bradford went to East Lancs in such a big way and this helps to explain it. Indeed, it would have been fascinating to have seen Roe’s version of the last trolleybus rebuilds in Bradford. Smart as the 1962 East Lancs rebuilds were, I venture to suggest that a trolleybus version of the Leeds 1962 *** CNW front-entrance bodies would have been something really special. Puzzle no longer, Paul: Bradford was proud, trad Bradford and CH Roe were in LEEDS! The twain did not always meet and the good burghers might prefer to look west for their tracklesses as it wasn’t really safe to go further east than English Electric at Thornbury. I am fortunate to have the opportunity to drive a similar vehicle to this one, namely DUK 833, fleet No 433 at the Black Country Museum, I have heard it mentioned that trolleybuses were built using wooden frames for electrical insulation purposes. I was also once told that the teak Roe used was imported into the UK as ships ballast! Our trolleybuses are tested for earth leakage each time they go into service at the museum. When trolley buses in regular service during the winter time when there could be heavy slush finding it’s way into areas that would normally not get water intrusion it was not unusual for passengers to get a slight electric "tingle" from touching a stanchion ect and apparently the normal practice was to take the bus out of service so that it could dry out. Further to the Worcestershire comment, Dudley was part of Worcs detached until the local government reorganisation of the 1970s. A couple of years ago a car enthusiast friend of a friend asked why the West Yorkshire Road Car Co. had had its headquarters in Harrogate, which is in North Yorkshire. He said he hadn’t realised that the town had been in the West Riding of Yorkshire prior to local government reorganisation in 1974, but being an "off comed ‘un" maybe he could be excused. The nearby city of Ripon was also home to a bus depot, which was unusual in being United Automobile’s only one located in the West Riding of Yorkshire, as far as I’m aware. The information about Trolley Bus 451, passing through Sedgley is not correct. 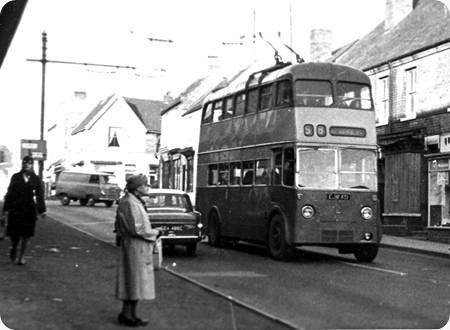 The bus has just passed the junction of Bilston Street, towards Sedgley Bull Ring, on its way to Dudley. I was a Wolverhampton Corporation Trolley Bus driver till 1960, and then at Wolverhampton and Dudley Midland Red, till the garage closed, as a Midland Red driver. Retired eventually back at Wolverhampton, when Dudley closed, taken over by WMPTE, then West Midland Travel.